The Galaxy Alpha has a metal frame and still manages to be surprisingly light – just 115g. That’s iPhone 5s territory and the Apple flagship has a 4″ screen versus the 4.7″ screen of the Alpha. It’s a Super AMOLED with 720p resolution, which is enough for a 300+ ppi pixel density. A 1080p screen would have helped seal the premium position of the Galaxy Alpha but even now its screen still has plenty of positives like excellent sunlight legibility and color rendering. Unfortunately, the Alpha didn’t stray very far from the Galaxy tree – its back panel is made of plastic with a pattern very similar to that of the Galaxy S5, which really hampers the premium feel. We guess that’s part of the secret to making it light but we would have accepted a few grams more for a metal black. Still, the Galaxy Alpha is the thinnest Galaxy phone yet. It measures just 6.7mm thick, which combined with how light it is gives the impression of a tiny phone. It’s not tiny though, the 4.7″ screen is roomy enough – Motorola, HTC and soon perhaps Apple will call it the perfect size. The metal-clad Samsung borrows a good deal from the Galaxy S5 – the entire TouchWiz stack, the fingerprint reader and heart rate monitor but it did not get a water resistance certification. That’s something that could have really helped it in its fight against the Sony Xperia Z1 Compact and the upcoming Z3 Compact. 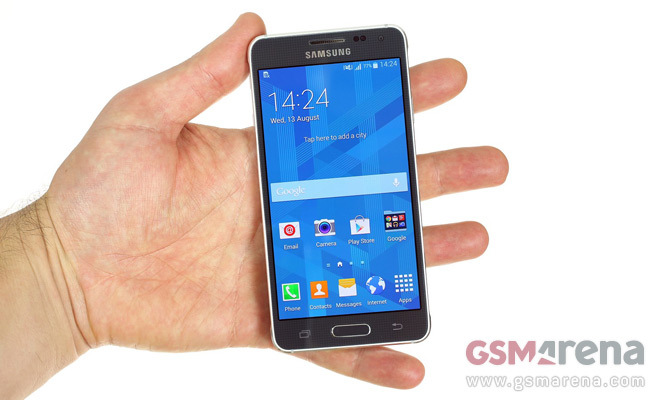 The Samsung Galaxy Alpha got a bespoke camera too – a 12MP shooter with a 16:9 sensor. Little is known about the camera though (ISOCELL? Sony?) but it can record 2160p video. The Z1 Compact can’t, even the HTC One (M8) and Nokia Lumia 930 flagships are 1080p only. It’s going to be a battle on two fronts for the Alpha, the new iPhone on one side and the new super mini from Sony on the other. We’re busy working on the review to find out just what the Galaxy Alpha has in its war chest and we’ll be publishing it soon on our homepage.